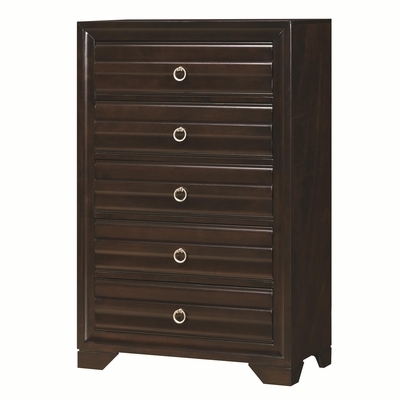 Enjoy beautiful storage capabilities with this chest of drawers. Five drawers give you plenty of space for extra clothing, blankets, or other items, and it also adds sophistication to the bedroom. Silver ring pull hardware is beautifully accentuated against the rich cappuccino finish, and the detailed panels on the drawer fronts creates a great transitional appeal. Get great usability from English dovetail joinery and sturdy bracket feet.